The stormy summer of 2016 marches on with yet another round of heavy rain. A stationary front was draped across central Minnesota on August 10, 2016. Thunderstorms developed and gained steam just south of this boundary in eastern South Dakota and west central Minnesota. During the afternoon and evening hours they spread to the east, producing rainfall rates of two three inches per hour. The storms reached the eastern Twin Cities by dusk. The storms continued through the night producing a vivid lightning show across the affected areas. The storms weakened and exited Minnesota by mid-morning of August 11. The storms produced a large area of two to three inches of rain, from Lac Qui Parle County eastward through Kandiyohi County, to the Twin Cities, and southeastward to Wabasha County. Within this large swath, two smaller areas received six inches of rain or more: one centered around the Willmar-Olivia area, and one in Wabasha County near the Mississippi River. The highest precipitation total found so far was 9.74 inches at a Kandiyohi Soil and Water Conservation District rain gauge site just east of Willmar. There were many reports of basement flooding in Willmar. One basement caved in. The arena and track at the Kandiohi County Fairgrounds flooded, postponing the demolition derby on the 11th. Residents in Willmar were being asked to limit water use due to the impact on the city's wastewater treatment plant. Olivia in Renville County was also hard hit with 7.12 inches of rain reported at nearby Bird Island. An unofficial 8.78 inches was reported 2 miles north of Olivia. The highest total found in Wabasha County was 7.75 inches in Theilman, with the most damage reported just across the border in Wisconsin in Buffalo County. 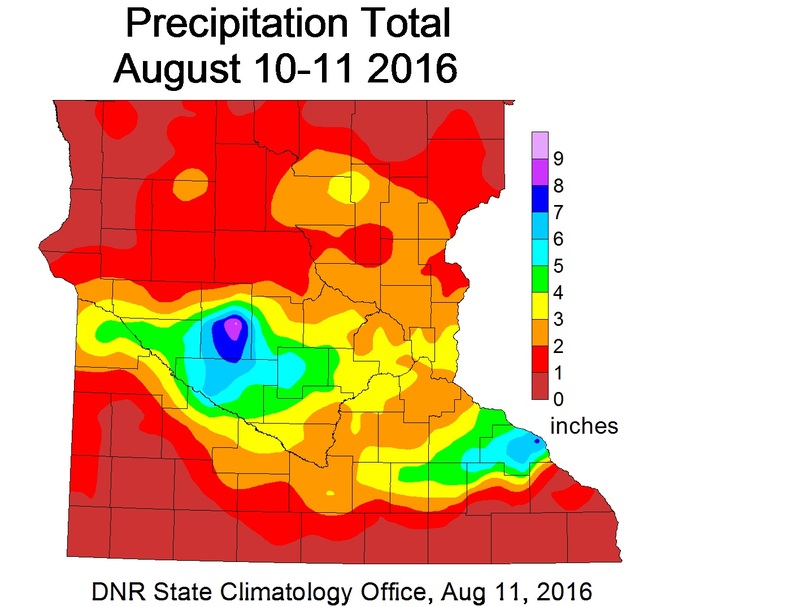 The two 6-inch rainfall areas combined to cover just over 1,000 square miles, making 2016 the first year on record with two "mega" rain events in Minnesota. A larger event (covering more area) hit northern and central Minnesota on July 11-12, 2016. Rainfall reports of 2.5" or greater are listed below. observers who provided many of these reports.